BAGHDAD September 3, 2007, 10:40 a.m. 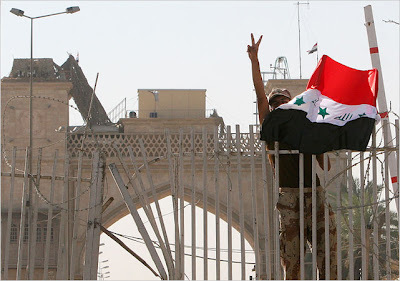 ET · Iraqi soldiers hoisted the nation’s flag over the Basra palace compound Monday after British troops withdrew from their last garrison in the city, leaving the country’s second biggest city largely in the hands in the hands of Iranian-backed Shiite militias. At al-Asad Air Base west of Baghdad, meanwhile, President Bush made a surprise visit to Iraq, hoping to bolster his case that the buildup of U.S. troops is helping stabilizing the country. And the U.S. command said a soldier was killed and three others injured when a roadside bomb blew up next to their patrol on Sunday outside of Baghdad. No further details were released. British vehicles rumbled out of the gates of the sprawling Basra Palace compound after dark Sunday and headed for the Basra’s international airport, about 12 miles away, where the last of Britain’s 5,500 soldiers are based.